Last Saturday it was managing editor of The Guardian Gary MacDougall's column, then it was the Eastern Graphic's weekly paper on Thursday?. 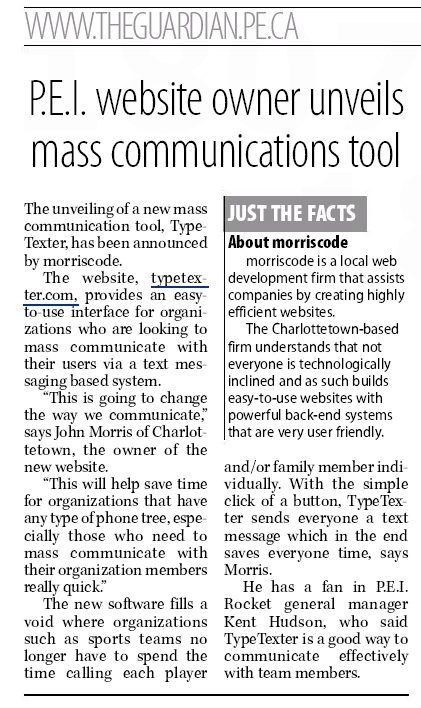 Brian Murray from UPEI/Holland College mentioned today TypeTexter made the business section of The Guardian on Saturday. My sister wanted to see Saturdays clip so for those interested here it is. Huge thanks to Charlottetown City Councilor Rob Lantz for sending me the digital version.